lava lamp | What happened in…. 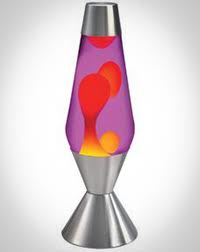 A lava lamp (or Astro lamp) is a decorative novelty item, invented by British accountant Edward Craven-Walker in 1963. The lamp contains blobs of coloured wax inside a glass vessel filled with clear liquid; the wax rises and falls as its density changes due to heating from an incandescent light bulb underneath the vessel. The appearance of the wax is suggestive of pāhoehoe lava, hence the name. The lamps are designed in a variety of styles and colours.